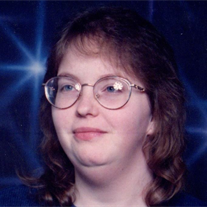 ELKHART- Catherine M. Davidson, 45, passed away peacefully while surrounded by her family Friday evening on March 31, 2017. She was born February 24, 1972 in Oahu, Hawaii to James and Myrtle (Sanford) Davidson. Catherine was a volunteer at the American Red Cross where she was later employed as an IT administrator. She was a member of the Elkhart Temple #14, Pythian Sisters. Catherine also became a volunteer for the Salvation Army where she utilized her skills in information technology to assist with the Christmas Program to help those in need through their organization. She loved frogs and had quite the collection. She will be deeply missed by her family and friends. In addition to her mother, Catherine is survived by her daughter, Caitlin Davidson; brothers, Bryan (Katie) Davidson of North Carolina, James (Jeanne) Davidson of Goshen, Indiana, Alan (Sharon) Davidson, and Robert (Laura) Davidson, both from Elkhart. She is also survived by her long-time and very special friend, Wayne Leedy of Rochester. Catherine was preceded in death by her father. Walley-Mills-Zimmerman Funeral Home is entrusted with her arrangements. There will be a Celebration of Life Ceremony on April 7, 2017, 12 pm at the Salvation Army with Major Nicholas Montgomery officiating. Family will be receiving friends one hour prior to service time. The family has asked that memorial contributions be made to the Humane Society in honor of Catherine’s legacy. "If fraternal love held all men bound, how beautiful this world would be."